This was the first of the new houses after Vanbrugh Castle which the architect built on Vanbrugh Fields in Greenwich. It was already known as `The Nunnery' when William Stukely sketched it in 1721. Vanbrugh probably built this house for his brother Philip, who lived in it when on leave from the Navy. It was demolished in 1911. A plan of the Nunnery in E.2124.77-1992 shows projected additions at either end. 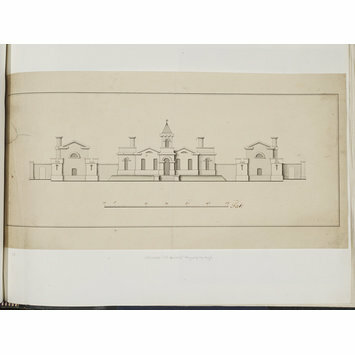 Elevation of The Nunnery, Greenwich, showing the central block with seven bays separated by walled yards from two extensions of a single bay each. Broken pedimented roofs contrast with castellated sections on each side of the single bay extensions. Scale: 1 inch to 10 feet. A repaired tear on the left side. Numbered in ink with the scale. This was the first of the new houses after Vanbrugh Castle which the architect built on Vanbrugh Fields in Greenwich. It was already known as `The Nunnery' when William Stukely sketched it in 1721. Vanbrugh probably built this house for his brother Philip, who lived in it when on leave from the Navy. It was demolished in 1911 (see Downes, 1987, p 434). See E.2124.77-1992. 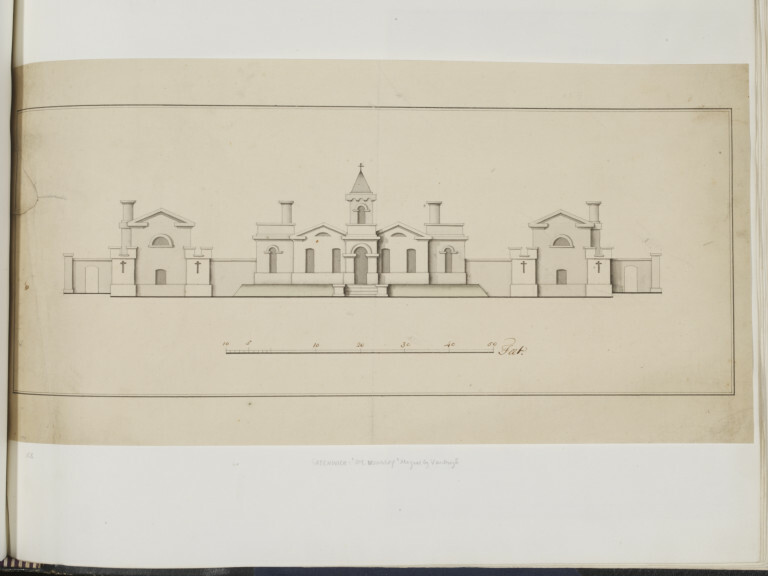 Elevation of The Nunnery, Greenwich; the Vanbrugh Album; office of Sir John Vanbrugh; ca. 1719-1720. Lorimer, C. and Newton, C. (ed. ), The collection of drawings by Sir John Vanbrugh and his circle in the Victoria and Albert Museum, London: V & A, 1996, p. 45, cat. 114. Downes, K., Sir John Vanbrugh: A Biography, 1987, p. 434.